This blog has been pretty quiet these past few months, heck for most of 2013. This post will shed light on what’s been going on in my world that I wasn’t comfortable sharing until now. Hope this fills in some blanks if you’ve been wondering about me. In the summer of 2012, my mother was diagnosed with colon cancer. It’s hard to read that sentence. It’s even harder to say that out loud to people. It was easier to just not say anything unless I had to. I still remember how hard it was to hear the news and after the initial shock, I was feeling pretty overwhelmed with all the hospital pamphlets and info. My sister and I took turns accompanying my mom for doctor appointments, chemotherapy and radiation treatments, and when we got the surgery dates in January 2013 and October 2013 we coordinated our schedules to make sure we had time to spend with mom and took turns cooking for her. The first surgery in January 2013 was absolutely nerve-wracking. We knew she would come out with a temporary ostomy which we all learned to care for. Her diet changed too. She needed to increase her sodium intake, cut back fibrous foods and eat foods that were more easily digestible like bread, meat and pasta. She also needed to chew her food many times to prevent any clogs (that would result in running to the nearest Emergency) and drink more fluids. We were nagging her on the regular. The second surgery in October 2013 reversed the ostomy and restored the use of her colon. She is doing well and in good spirits. Her recovery this time around was comparatively much better than her first surgery. Everyone who sees her says she looks good. It’s funny because I’ve seen her throughout the process, sometimes when someone else says that I look at her and remember how far she’s come and how many hurdles she’s overcome. People closest to me, who had come to know about my mother’s treatments/surgeries were very sweet. Offering to help me with groceries or rides. Although I didn’t take anyone up on their offers, just knowing that they were thinking of our family was enough. It was nice just to know that we were in people’s thoughts. I’ve been told by others that I’m strong. Especially when they come to learn about what’s been going on. There were times when I was scared, sad, overwhelmed, irritated and fatigued, which is of course absolutely understandable and only made me appreciate moments where I found something to laugh about or some kind of funny distraction. I tried to be as calm as I could around my mom especially before she began her chemo/radiation treatments and before and after her surgeries. Her attitude has been good for the most part. She’s always been focused on getting better, getting stronger, becoming independent again. These big scary life changing moments made me feel completely stretched (mentally, physically, emotionally) and at the same time made me appreciate things more. A big one for me, because my favourite time is meal time, is being able to eat anything you want and knowing that that in itself is a gift because not everyone can. To respect my mother’s wishes, I didn’t want to share this online unless she was comfortable. 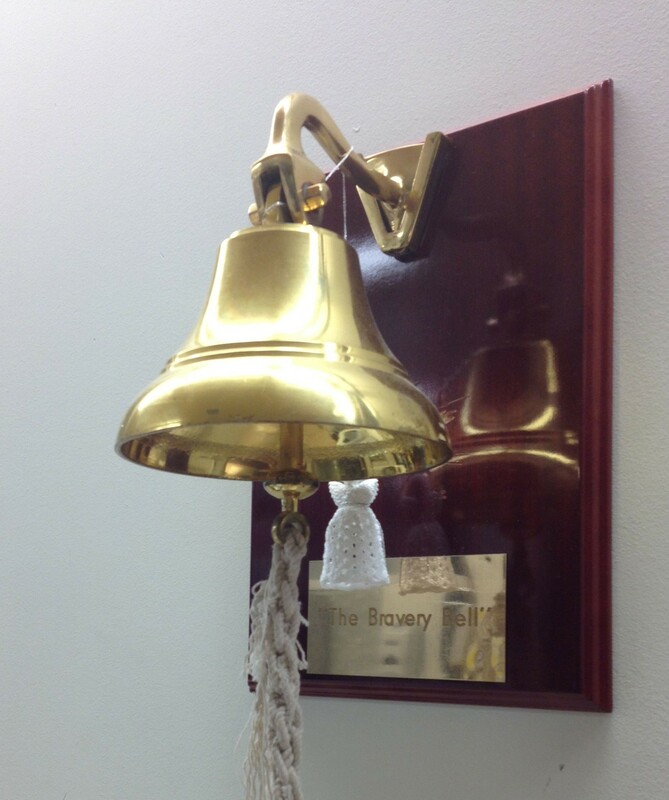 We learned about the bravery bell early on in my mother’s treatment. She said she didn’t want to ring it until she was done with chemo. So, after her second round of chemo, she rang the bell. We took pictures and made a short video. Minutes after, I asked if she was okay with me sharing her story and she said yes, that she wanted people who are in similar shoes to remember to be brave. This conversation happened in late June but I didn’t feel comfortable sharing until my after my mother’s second surgery and until I felt like I could put this into words.